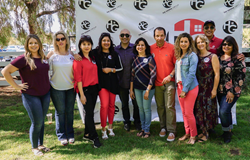 San Jose Realtors from The Hanna Group extend their charity and community involvement year-round. It’s a joy to connect with our community in this way. And we don’t want to stop here. We will also be donating much-needed items throughout the holiday season to local charity organizations. Agents from The Hanna Group take great pride in their community and make it a priority to extend their charity all year long. Just recently, The Hanna Group hosted a free Fall Festival for families in the San Jose community. The free event was open to all and had an attendance of over 500 local residents. The event was held at Spina Farms Pumpkin Patch and featured face painting, a pumpkin decorating contest, raffles, prizes and more. Children eagerly came dressed in their best Halloween costume in hopes to win the iPad grand prize costume contest and all attendees were eligible to win an Apple Watch simply for attending. The Hanna Group works with buyers and sellers in the Bay Area. The Hanna Group focuses on the needs of their clients, tailor an individual strategy to achieve their goals, and provide them with unsurpassed expertise in real estate marketing and negotiation. For more information call (408) 515-1613 or visit http://www.hannagrouprealestate.com.